Monster Trucks once again invaded Hagerstown Speedway to compete in Monster Jam. Bubba's Garage was on hand to experience the Pit Party and all of the show action. Because of Friday's rain-out, Saturday was sold out and it was really packed. The lines were long but fans behaved themselves for the most part. 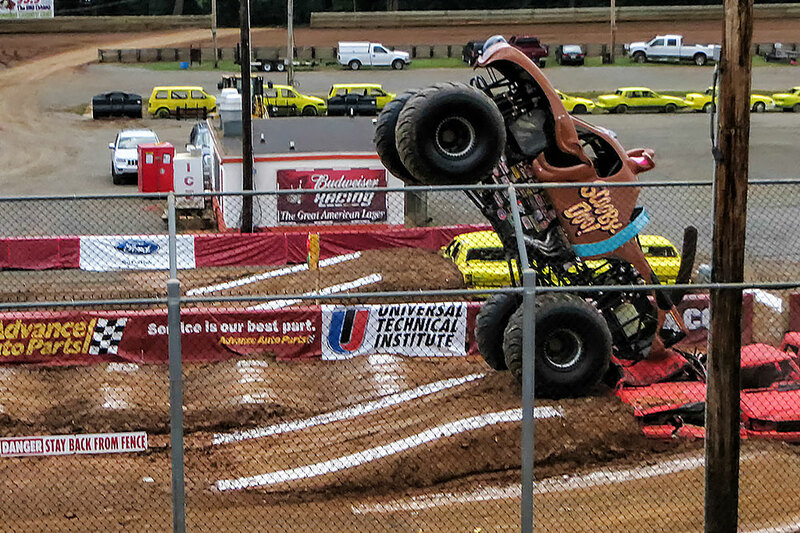 Seven trucks were competing. 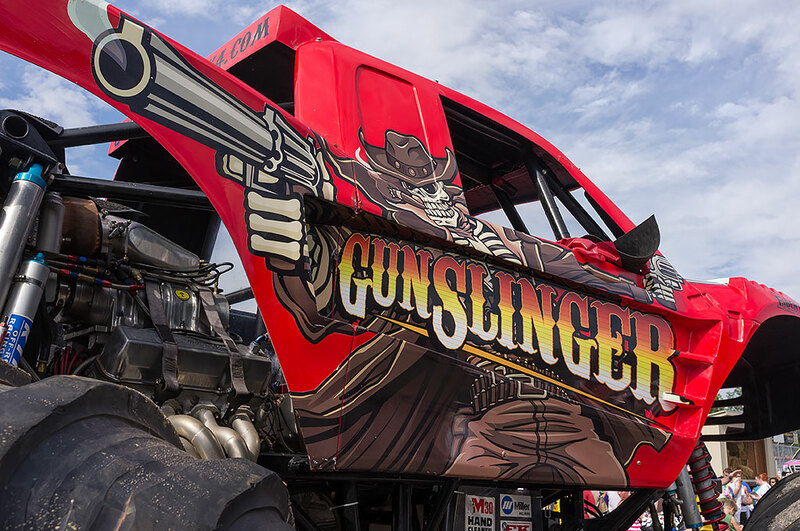 The first we encountered was Gunslinger. Scott Hartsock drives this blown and alcohol Injected 557 CI SVO Ford powered monster which sits on 66" tires. 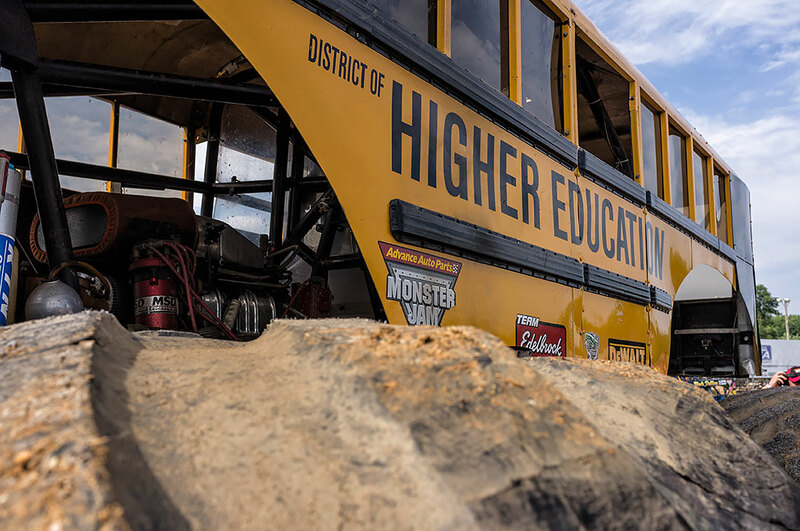 Higher Education is a local monster truck. It is based out of Hagerstown, MD and is driven by Jim Tracey. 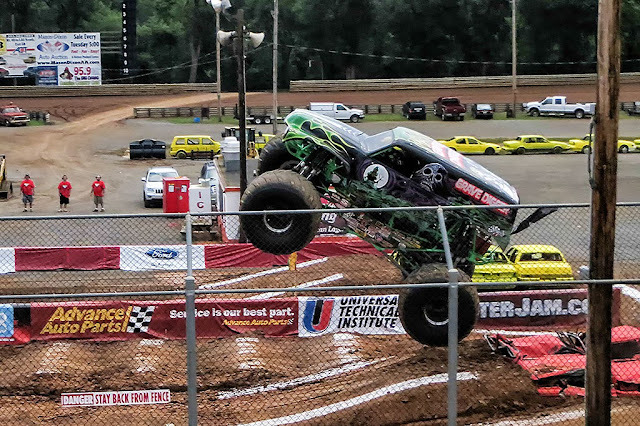 Its 540 CI big block Ford, which is also blown and alcohol injected, allowed Jim to launch his truck to some of the highest heights of the evening. Everyone at Bubba's Garage was rooting for the Scooby-Doo Monster Truck. 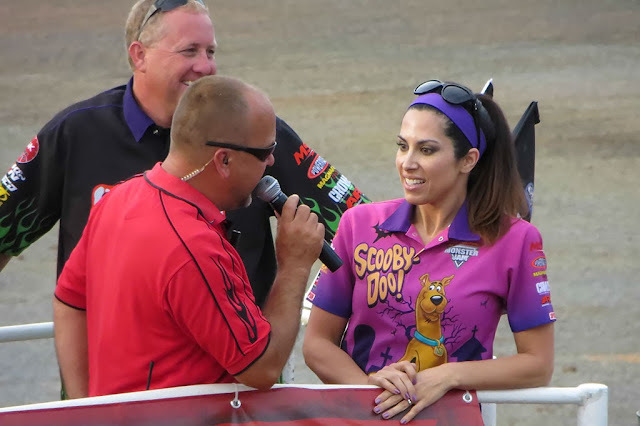 Nicole Johnson, the driver of the Scooby-Doo, is fun to watch as she is definitely all girl. I was chuckling as she ran across the track being very careful to avoid the mud puddles. I even noticed that her nails matched the color of Scooby's logo. But don't let all that feminine appearance fool you. 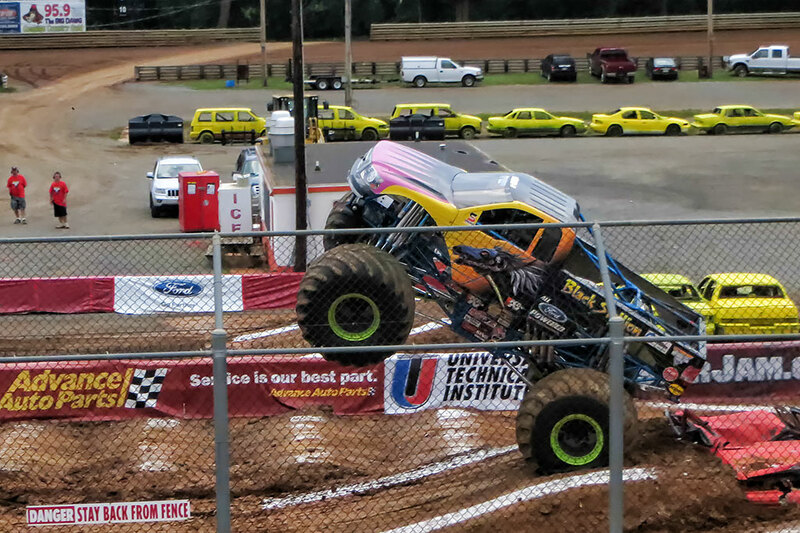 She can handle her 540 CI Merlin powered truck as well as the guys. She was just 1 point away from taking the Wheelie contest on Saturday. 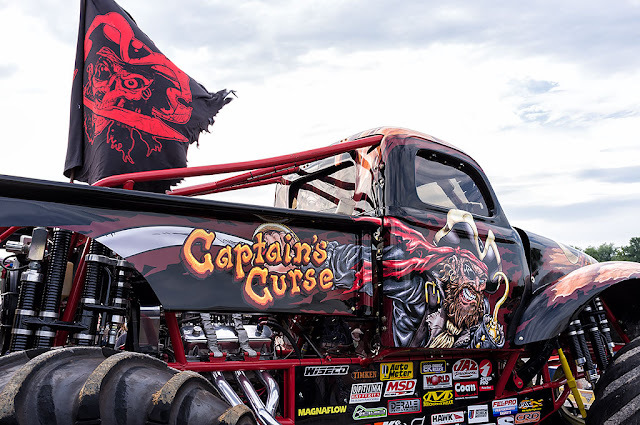 Alex Blackwell pilots Captain's Curse at Monster Jam. This Monster Truck puts out 1500 horsepower from its 540 CI Merlin engine. 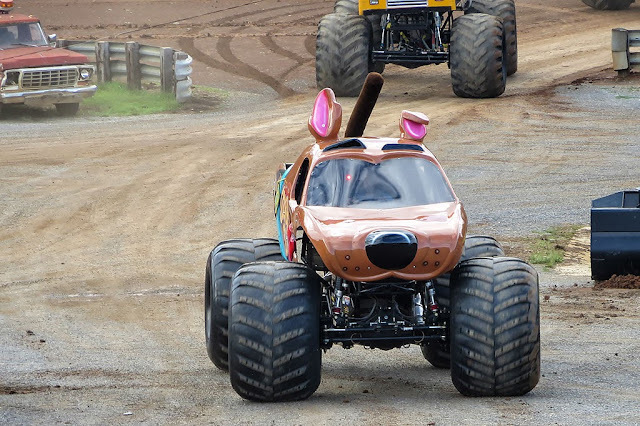 He needs all of those to spin those huge 66" tires! 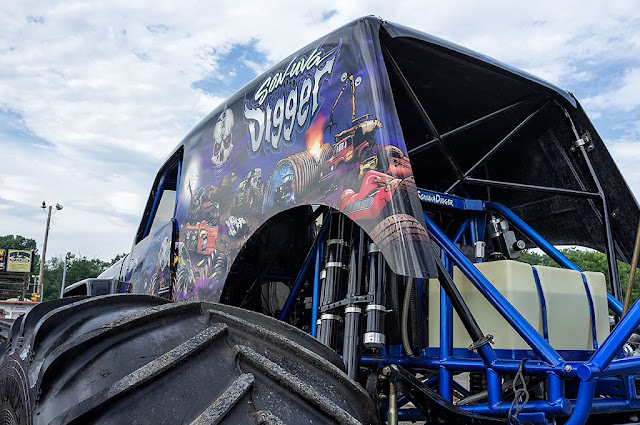 Another local truck to Hagerstown, MD is the Black Stallion Monster truck driven by Mike Vaters. 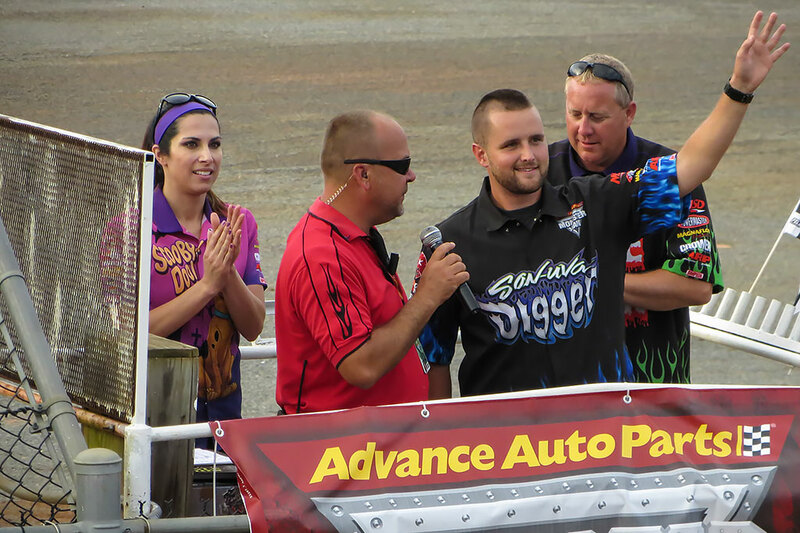 Mike would come close to winning the side-by-side race but had to settle for second place this evening. 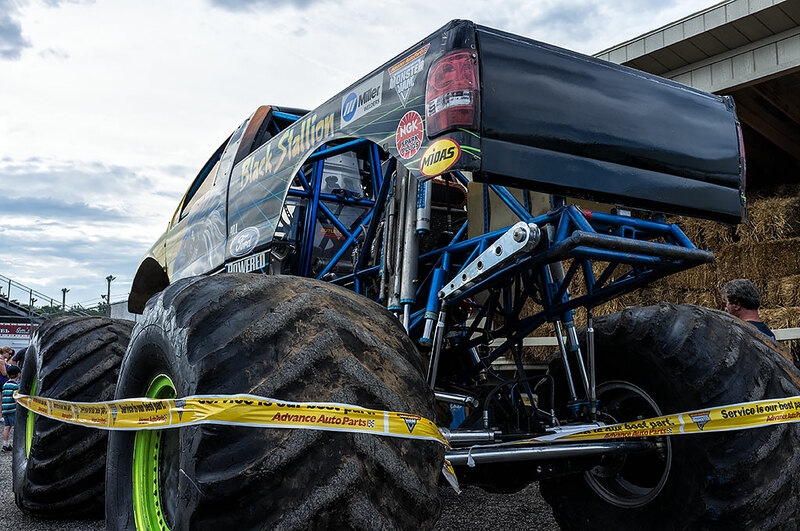 His truck is powered by a blown and alcohol injected 557 CI big block Ford. Of course you can't go near a Monster Truck event and not hear someone talking about Grave Digger. Dennis Anderson has grown the Grave Digger line into one of the most recognized of all the Monster Trucks. 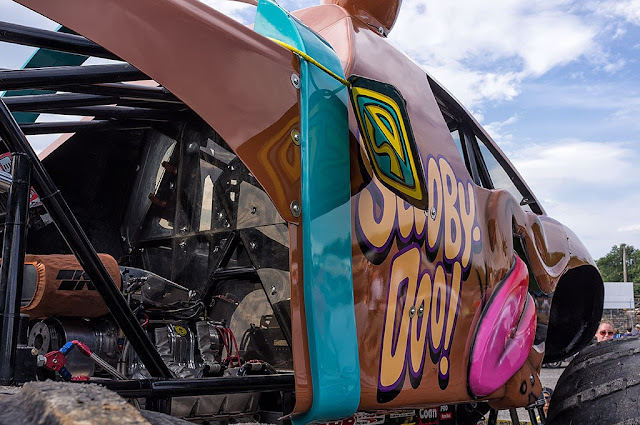 Randy Brown was the driver for this weekend's competition. 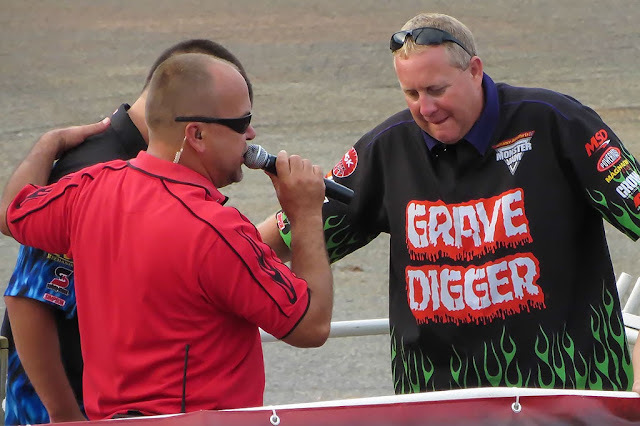 Son-uva Digger is the youngster to Grave Digger. 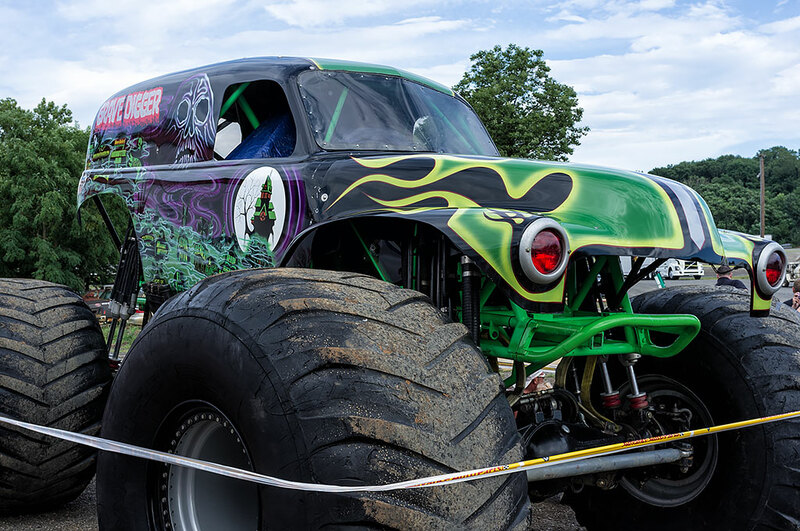 Ryan Anderson thrills audiences with his skill behind the wheel of this 1950's Willys bodied styled Monster truck. It was a clean sweep for Ryan as he won all three events: Wheelie Contest, Side-by-Side Racing, and Freestyle. The air and speed that Ryan produces on his runs is fantastic. 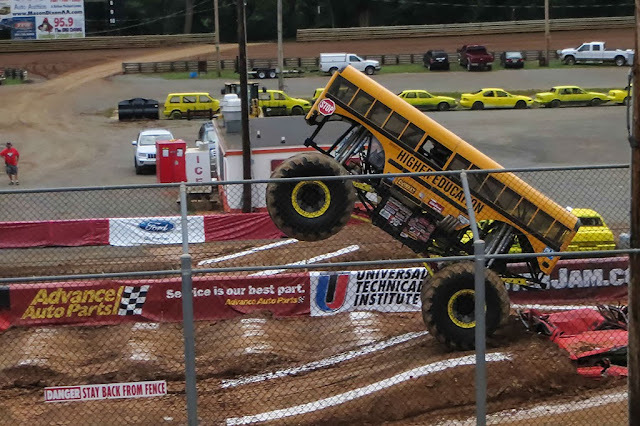 Hagerstown Speedway is a good place for these Monster Trucks to run as the long track allows the trucks to get some speed for incredible jumps. The facilities are nice and the stands make for decent viewing. 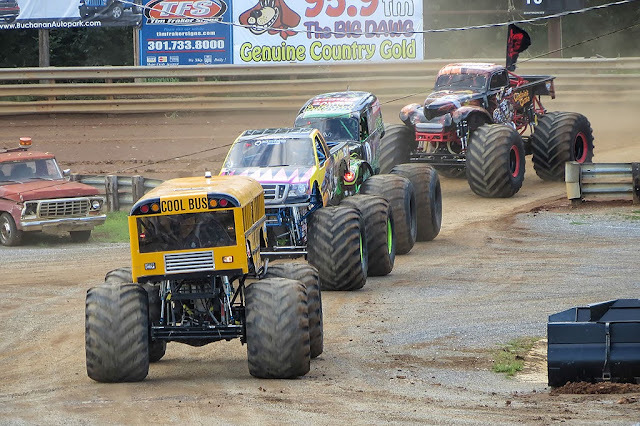 When the trucks line up again for Monster Jam make sure you line up for tickets!